Dublin needs more skyscrapers. That’s according to property consultants Knight Frank, who say Ireland will lose out on tech investment if employees can’t live close to where they work. “If you are a Google or a LinkedIn, then there’s a war for talent on and the people you are hoping to attract want to work in the city centre and to live near to where they work. Companies want to place their business in areas where they are most likely to attract key employees and increasingly that is in the city centre,” he added. 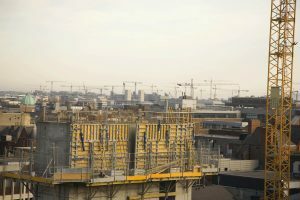 “Dublin is a place where, by and large, we tend to build buildings that are seven or eight storeys high. What we want to avoid is urban sprawl and so what needs to happen is that we build beautiful buildings that are maybe 20 to 30 storeys high instead,” he said. “You get a company like Google coming here and they typically take a relatively small amount of space initially, but they all want to be in a city that will enable them to expand. In Dublin we don’t have a lot of spare buildings and the problem is that the funding side of speculative development is not happening. We need a debt market and don’t have one,” he said. A Knight Frank report just published lists the cost of renting office space in tower buildings across key global cities. Hong Kong still tops the ranking with a prime rent of US$255.50 per sq. ft., over US$100 more expensive than New York which sits in 2nd place with a rent of US$153 per sq. ft.
Hong Kong’s large lead in the index can be attributed to a variety of factors, such as the restricted geographic area of the city which results in developers having to convert air into ‘land’ and build upwards. *Q4 2014 to Q2 2015, excluding exchange rate fluctuations.